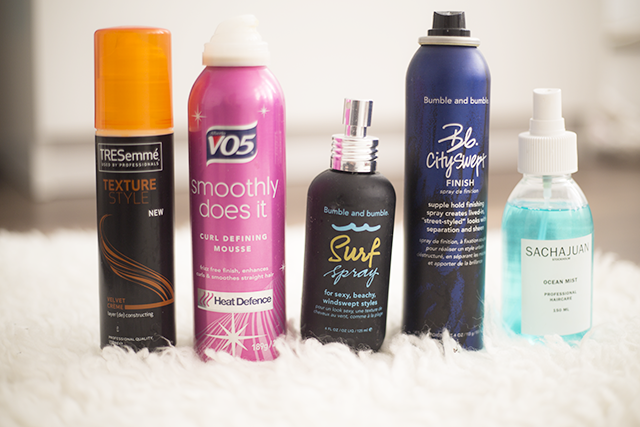 I wanted to do my hair care routine post for such a long time, it's going to be a long one! My hair natural texture is a bit wavy/curly, but frizzy at the same time. Really does depends from the shampoos and conditioners I tend to use. I love trying new shampoos and conditioners, I don't often go back to the same duo, there are so many brands to try out in the market. The Lee Stafford Bleach Blondes is currently my fav combo! As I've dyed my hair to a lighter blonde(just one tone lighter), this is a life saver if I want to get rid of yellow tones from my hair. I planning to invest in the Christophe Robin Shade Variation Care Hair Mask, which also helps to get rid of the brassy tones. I will forever love TRESemme products, they don't have the best ingredients list, but they work so well with my hair. The TRESemme Keratin Smooth Conditioner is my favourite to use under shower, leaves my hair feeling really smooth and less frizzy. As I have problems with my scalp from time to time I tend to use more delicate shampoo, Aveda Scalp Benefits Shampoo is very good whenever the situation gets bad. Although I hate the scent, luckily conditioner kills it. Hair masks, I own so many. This was a difficult choice, will definitely do a post all about my hair masks. My favourite pre-shampoo hair mask is Philip Kingsley Elasticizer, it's so expensive, but so amazing at the same time! I tend to use around twice a month, you can apply it to wet or dry hair, I like to wet mine and then either leave it on overnight or have it on my hair for an hour during the day. You can read the full review here. I also really like Bumble and Bumble Quenching Masque, keeps my hair hydrated. Although the BB Deeep! hair mask is so much better, sadly it's discontinued. For the scalps I would recommend the Philip Kingsley Scalp Toner, I like to apply it on my scalps just after washing my hair, I then massage it in. The Trevor Sorbie Rejuvenate Scalp Serum is the bomb! Smells so good!!! Apparently it simulates the scalps and help your hair grow. All you need is few drops to cover the whole head. Serum wise I love Biosilk Serum, smells so good! It's amazing at smoothing down frizzy hair. I normally tend to stock up, every time I go to Poland. The Schwarzkopf Essence Ultimate Hair Oil is not something that I love, but it does do the job. I just can't wait to use it up and switch up for something else. The hair styling products there are so many, but I just picked out the one which I tend to reach for the most often. While searching for the TRESemme Texture Style Creme I've discovered that the range have been discontinued. I really like to use it whenever I straight my hair, just to give them extra texture. Vo5 Smoothly Does it Curly Defining Mousse is great to use on wet hair, once they dry they will became more curly, guess that only happens because of my hair texture. Bumble and Bumble Surf Spray is great to use if you want more texture in your hair, I wish they could only improve the scent. Sachajuan Ocean Mist is also a great texturising smell. I think it's my winner. I really like what it does to my hair. Bumble and Bumble Cityswept is a finishing spray, perfect to use after curling your hair. Such a long post, hopefully I've manged to explain everything. I tend to switch up my hair routine very often, I will try to do more hair post in future.